Passive intermodulation distortion is the result of discontinuities, metal-to-metal contact, and material properties that lead to nonlinear characteristics of typically linear passive transmission lines and components. 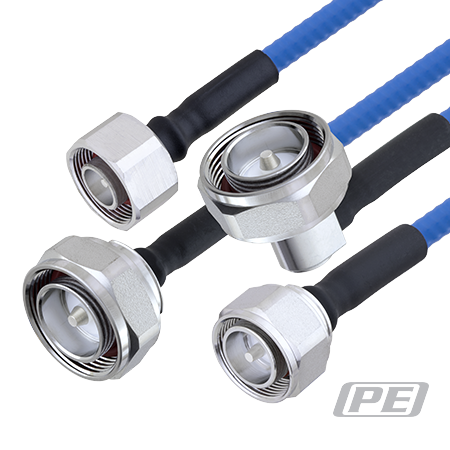 PIM can be induced in a variety of RF components, such as connectors, adapters, cable, combiners, splitters, couplers, tappers, attenuators, terminators, antennas, and cable-to-board interconnect. PIM is generated when two or more signal components at different frequencies interact at a non-linear junction and create a distortion product from frequency mixing. PIM becomes an issue when the distortion product of a transmission is either reflected back toward a sensitive receiver and is in the receive band, or a distortion product is transmitted and received by nearby communication systems susceptible to the particular distortion product. Due to the passive mixing of PIM generators, the power levels produced by PIM generators is generally weak, and only higher power transmission signals tend to generate PIM power levels that are significant. In years past, PIM issues were avoided by choosing frequency bands and filters that mitigated the amount of PIM that could impact receive bands. However, modern cellular, Wi-Fi, emergency/public service bands, new 5G cellular bands, ISM bands, TV white space bands, and other wireless services are often used in conjunction, especially with distributed antenna systems (DAS). Many DAS are designed and installed to carry multi-band signals, either from a variety of cellular carriers, emergency/public safety, Wi-Fi, and other building automation services. Hence, the antennas, amplifiers, filters, and transmission lines for DAS are all designed to operate over a wide range of sub-6 GHz frequencies, which is subsequently where the most spectrum congestion is and the greatest harm from PIM can occur. With multi-carrier systems PIM products can potentially be created by the mixing of any combination of signals and have a higher chance of landing in the bandwidth of sensitive wide-band receivers. Narrow-band systems are less susceptible to PIM, as the pass-band of the receiver tends to be very narrow, so a precise combination of signals is necessary to create a PIM product that lands in that narrow bandwidth. However, with modern highly modulated wideband communication systems, such as 4G LTE, Wi-Fi, and new 5G NR sub-6 GHz frequency bands, receive bandwidth is much wider, and the heavily modulated wide-band signals also generate much wider band PIM products than narrow band signals. For example, if the fundamentals from the two mixing signals is 10 MHz, then the third-order product will have three times the bandwidth (30 MHz) and the fifth-order product will have five times the bandwidth (50 MHz). With heavily modulated wide-band signals, especially those that use Spread Spectrum techniques, the receive signals are often very weak, and PIM products that overlap with the receiver bandwidth could easily desensitize the receiver and dramatically disrupt communications. Stay tuned for next week’s post, which will discuss more low PIM components, such as Directional Couplers, Loads, Attenuators, Adapters, and Antennas.